Leili Fatehi has more than a decade of legal, public policy, and advocacy experience addressing complex issues and challenges involving science, technology, engineering, and society. 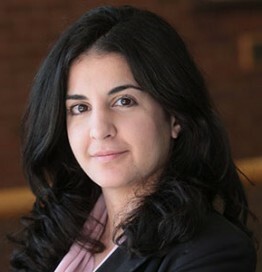 She is a nationally recognized expert in anticipatory approaches to science and technology governance and oversight, and is particularly well-known for her work dealing with the novel opportunities and challenges of emerging technologies such as nanotechnology, biotechnology, genetics and genomics, synthetic biology, social robotics, and autonomous vehicle technologies. Leili offers deep substantive knowledge of the legal, regulatory, market, and non-market systems that govern decision-making at the federal, state, and local levels, including how these systems interact with one another. She is also skilled and experienced in communicating with, building support among, and developing strategies to influence diverse stakeholder groups, including legislative and agency decision-makers. Prior to founding Apparatus, Leili was the founding Director of the University of Minnesota’s Initiative on Governance of Emerging Technological Systems (IGETS), a network of interdisciplinary scholar, policymakers, industry partners, and community members focused on producing information, facilitating dialogue, and promoting policies to support the fair and responsible development of technologies with known or uncertain economic, environmental, health, and social implications. She was also previously a Research Fellow at the Humphrey School of Public Affair’s Center for Science, Technology, and Public Policy and Associate Director for Research and Education at the University of Minnesota’s Consortium on Law and Values in Health, Environment, and the Life Sciences. Leili also holds a number of academic positions at the University—she is Adjunct Associate Professor of Law at the University’s Law School, Lecturer at the Humphrey School of Public Affairs, and Affiliate Faculty at the University’s Center for Bioethics.